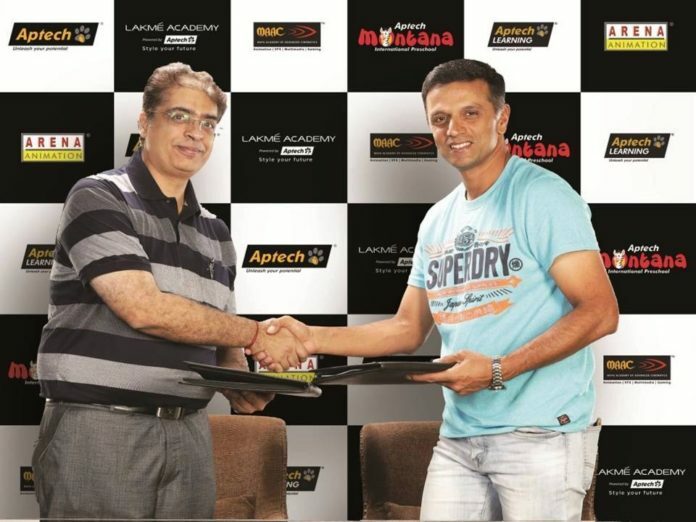 New Delhi: Aptech Ltd., the global education and training company with presence in over 40 countries, today announced renowned cricketer and current Under-19 India Team Coach, Rahul Dravid, as a global brand ambassador for Aptech Learning and Arena Animation. One of the finest Indian cricketing legends, Rahul Dravid, was selected due to his undying zeal to empower the youth of India. “Rahul Dravid or ‘The Wall’ has always produced a blueprint to guide the country’s future talent. He has been an exemplary leader and great team player. His recent decision to coach the Under-19 India team was testimony to his commitment towards building a nation where the dreams and energy of youth is channelized towards building a strong nation. Aptech too has been tirelessly working towards making the youth in over 40 countries chisel their skills to be more successful in the career of their choice. Therefore, this partnership is based on mutual trust and vision for the country’s progress,” said Pravir Arora, Executive Vice President, Aptech Ltd. In the last three decades Aptech has been a skill and non-formal education leader offering specialized and certified training in banking and finance, language proficiency, IT education, hardware and networking, as well as, travel and tourism, hospitality, aviation and retail operations skills. Aptech has successfully trained over 7 million students through its two main streams of business – individual training and Enterprise businesses, and has effectively ventured into ten diverse sectors ranging from IT training to personal development. Arena Animation has been a pioneer in M&E education with its legacy of leading the industry in over 40 countries. The company has been skilling youth from the past 22 years, and has trained over 5 lakh students in animation, VFX, film making, augment and virtual reality, gaming, digital, graphics and the web designing. The Indian animation and VFX industry has grown significantly in over the years, not only supporting the growing Indian M&E sector but also serving the world. According to the recent FICCI FRAMES report, the animation industry was valued at Rs. 17 billion, and is expected to continue its growth at a CAGR of 11% till 2020. This presents a huge opportunity for growth for the youth of the country.